Our range of products include bottle pull out (soft close) and bottle pullouts. 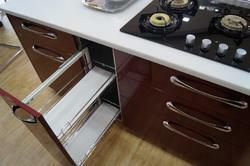 We are manufacturer and export in stainless steel kitchen, wardrobes, bar,steel interior and many more. Looking for Bottle Pullout ?